The scholarship estimate includes automatically awarded and potential scholarships for the 2019-20 school year for first-time freshmen. Fill out the form below to receive your estimated scholarships. To receive a more accurate review of the financial aid you may qualify for please use the Net Price Calculator. To get an overview of the requirements for our automatically reviewed scholarships please review our scholarship chart. What do you expect your final high school GPA will be? What were your ACT or SAT scores? Combine the best sub-scores from different test dates into a super score. What was your ACT or SAT Math score? IMPORTANT NOTE: You qualify for . These are only estimates and are subject to change. They should not be construed as official awards but are for informational purposes only. If you would like an estimate that includes tuition, fees and other possible financial aid please use the Net Price Calculator. You can also use our scholarship chart to learn which scores you can improve to receive more scholarship money. The supplied scores do not qualify you for any scholarships. Don't let this deter you. You may still qualify for other scholarships and financial aid. If you would like an estimate that includes tuition, fees and other possible financial aid please use the Net Price Calculator. 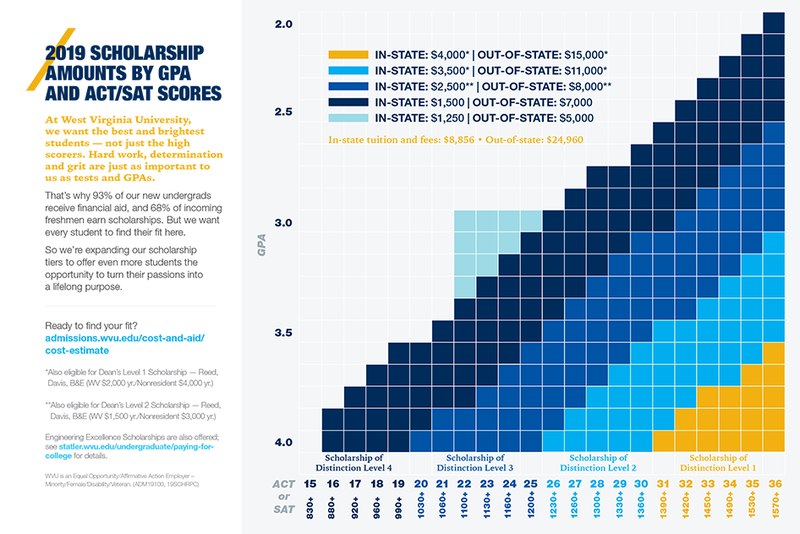 You can also use our scholarship chart to learn which scores to improve so you can qualify for our automatic scholarships.